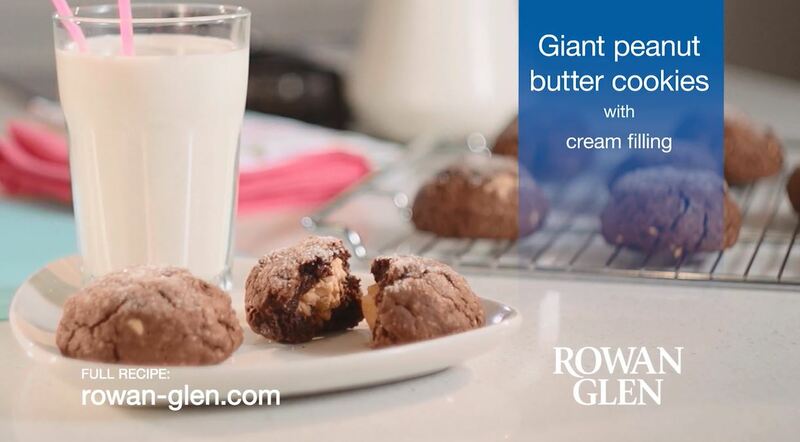 These giant chocolate and peanut butter stuffed cookies are perfect for the festive season or anytime. Serve with a glass of ice cold milk! 1. Preheat the oven to 180c. Line two baking sheets with parchment paper or silicone liners and set aside. 2. To make the filling, cream together the peanut butter, powdered sugar and a touch of water until well blended. Refrigerate the mixture while you mix up the dough to make it easier to handle. 3. To make the cookie dough, in a large bowl cream together the sugar, brown sugar, butter, and peanut butter until light and fluffy. Add the egg and vanilla and beat until smooth. Add the flour, cocoa powder, and baking powder, and mix until a thick dough forms. If the dough is crumbly, add 1-2 tablespoons milk. 4. Divide the dough into 16 pieces that are roughly equal in size. Remove the chilled filling from the fridge and divide it into 16 equally sized pieces, then roll them into balls and set aside. 5. Place a piece of dough in the palm of your hand and flatten it out. Place a filling ball in the middle of the dough and wrap the dough around it, rolling it into a ball to seal it. 6. Dip the top of the ball into sugar, place it on the baking sheet, and flatten it lightly with your hand. Repeat with remaining dough, spacing it out on the cookie sheets. 7. Bake 8-10 minutes or until the cookies are set and slightly cracked around the edges.